Where will my Energy Medicine session take place? What parts of my body will be contacted during my Energy Medicine session? What will the Energy Medicine session feel like? 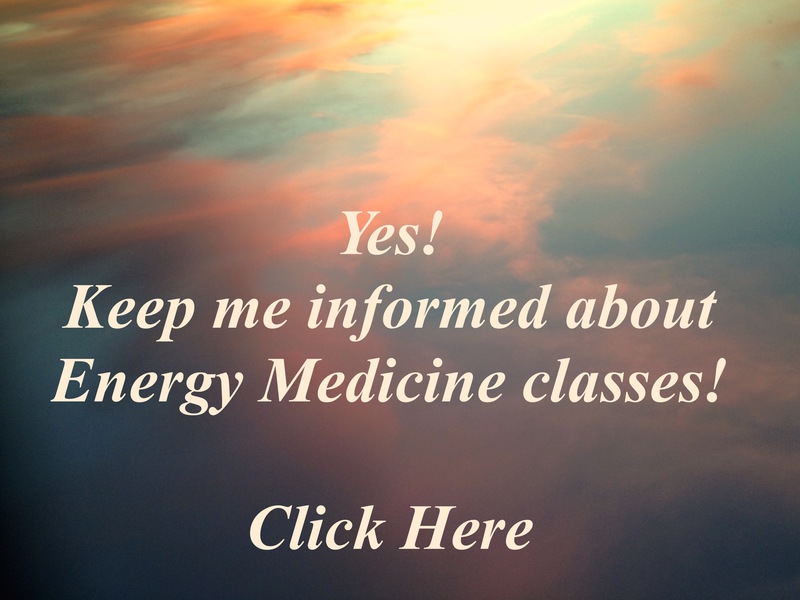 Are there different kinds of Energy Medicine sessions? What should I do during the Energy Medicine session? How will I feel after my Energy Medicine session? What are the benefits of Energy Medicine treatments? Are there any medical conditions that would make Energy Medicine inadvisable? Your Energy Medicine session will take place in a warm, comfortable, quiet room. You will lie on a table especially designed for your comfort. Energy Medicine sessions are performed with the client fully clothed; however, it is suggested that you wear light-weight, unrestrictive, comfortable clothing. Energy Medicine treatments are effective when the practitioner makes light contact with the body, or works in the bio-field (or, "aura.") When offering acupressure, I will gently hold my fingertips on your wrists and hands, along with your feet or ankles. Energy Medicine sessions are non-invasive. Your comfort is my first priority; your session is entirely for you – so if at any time you are not comfortable with a technique, tell me so I can adjust the session to accommodate your needs. I employ Energy Kinesiology to test the relative strength of different muscles, to communicate with your body's energies. You will be asked to maintain a position with your arm or leg while I apply mild pressure to shift you from that position. You will notice that with some energy tests the body responds by weakening the muscle, and with other tests the same muscle seems remarkably strong. These energy tests provide us with vital communication from your inner healing intelligence, about the state of your energy field and your body energies. Some points on the body are massaged with moderate pressure, and where energy needs to move you might experience discomfort or pain. 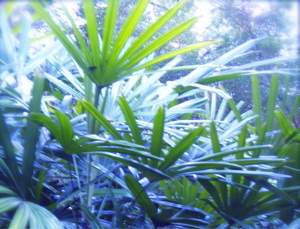 This is a very brief part of the session, and afterwards there follows an increased sense of well-being and alertness. You may feel tingling, electrical sensations or mild shaking as energy blocks clear. Sometimes you may fall asleep during a session. Most clients report a sense of deep calm, enhanced clarity, and increased vitality after their sessions. Each session is unique, and depends on what your body energies communicate as the priority of focus. I will follow the lead of your body's healing intelligence, and work among the energy systems: Meridians, Strange Flows, Auric Field, Chakras, Celtic Weave, Five Rhythms (or Five Elements), Grounding and body polarity, Neurological Cross-Patterning and Organization, the Triple Warmer, and the body's Electrical system. Working with each system involves different protocols and methods of shifting the energy patterns. Mostly, you will just rest on the massage table as I offer "healing invitations" to your energy field. When we use the biofeedback of your body, I will ask you to maintain an arm or leg position for energy testing. Sometimes I might ask you to rest your hands or fingertips on energy access points on your body while I address other points, providing a a four-handed session. During some sessions you may just close your eyes and rest, but always communicating if or when you need to adjust anything to maintain your comfort. Please voice any questions or concerns you have regarding the session, or about the particular technique being used. Most people feel very relaxed. You may experience freedom from long-term aches and pains. Healing is unique to everyone; sometimes it proceeds with dramatic speed, and other times it is a gentle gradual change over time, giving your system time to integrate. After the session, extra water and rest are recommended. Clients often experience increased energy, heightened awareness, and greater productivity which can last for days. However, when some long-held energy patterns begin to shift, one can experience temporary emotional or physical discomfort within 24 to 48 hours following a session. Since toxins are released from your soft tissues during energy work, it is recommended you drink plenty of water after your session. I recommend all my clients to call me if there is discomfort after a session. What are the benefits of Energy Medicine sessions? Energy Medicine is the safest, most natural, most readily available medicine there is, and there are no toxic side effects! Your entire being yearns to heal on every level, and Energy Medicine teaches you to participate more fully and consciously in your own healing, health and well-being. Lyn's expertise helps you create new energy patterns that support your vitality, healing, and joy. Energy Medicine is known to contribute to better sleep, improved concentration, reduced anxiety and an overall sense of well-being. For every disorder and discomfort there are patterns of energy, and when these energy patterns are restored to balance, there is increase in well-being. Benefit is found for acute and chronic physical conditions, stress, emotional states, and unhealthy lifestyle habits. We do not make any claims of cure, but assure you that where there is life, the life force yearns for health, balance, and joy. Energy Medicine ministers to your life force. Some of the most dramatic healing I have been priviliged to be part of in my work are: resolution of asthma, full restoration of a shattered bone, inner peace within an hour for one suffering from PTSD, flexibility restored to limbs of an client with Rheumatoid Arthritis, mental sharpness and clarity restored in an elder, severe pain medicated with morphine for 9 years resolve after one session, and feelings of "depression" lifting completely after 15 minutes. While these are exciting and very satisfying, the healing pace of many individuals, is gradual and incremental, with a distinct increase in general ease from the first session. Are there any medical conditions that would make Energy Medicine sessions inadvisable? Energy Medicine is compatible with every medical condition, and adds a new dimension to your healing journey. However, it is imperative that you inform your Energy Medicine health care provider of any health problems, and medications you are taking. More Questions? Please write to me via my "Contact Lyn" page, or call 407-310-2732.